On a Saturday at the end of May two coaches left Leicester at 6am with Orchestra players, their guests and instruments (Including the drums and harp!). 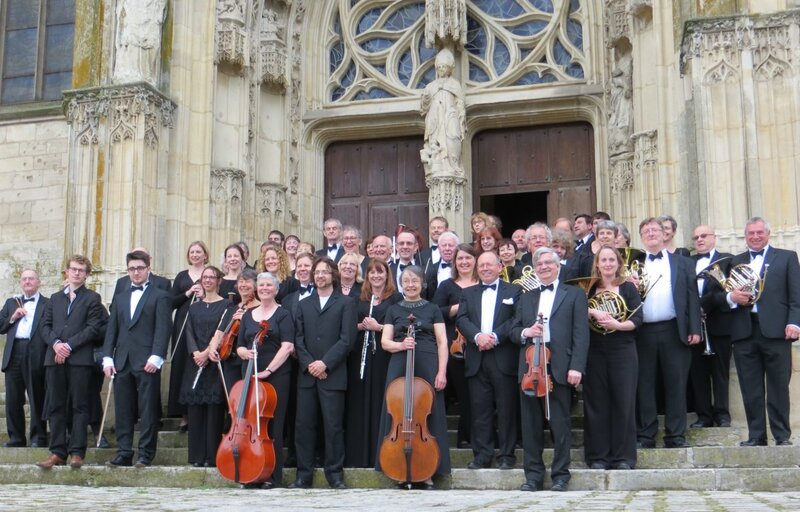 We were en route for Reims in the Champagne-Ardennes region of North-East France for the ninth LSO Tour overseas. We had a smooth journey to Dover but heightened security there meant we had to get off the coach and file through the French passport control building. This meant we missed our planned ferry, but we caught up time on the road later. Other players had made their own way to Reims and we met up at the conveniently located Hotel on the outskirts of Reims. It was an ideal base and included an outdoor swimming pool which the hardier members made use of before breakfast. An evening meal had been organised at a nearby Taverne. The next day we left after breakfast for a day at the town of Charleville-Mézières towards the Belgian border which was the venue for the first concert. It is actually two former towns either side of the Meuse river, now united. After some sightseeing it was time for the rehearsal in the large Basilique Notre Dame d’Esperance. Here we were reminded that this area of France was heavily damaged in both World Wars and the churches, which are old, had in fact been extensively rebuilt to their original form. 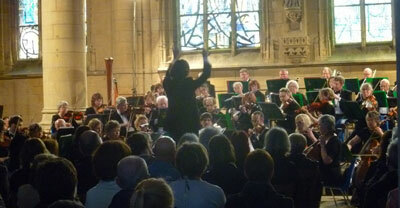 The concert programme included the popular Prelude to Hansel and Gretel by Humperdinck and Bizet’s Carmen Suite No 1, pieces by Liadov and Malcolm Sargent and ended with Borodin’s 2nd Symphony. This early evening concert was very well attended by an enthusiastic audience who began arriving well before the start time. As with most churches, the acoustic was very reverberant! Our hosts provided drinks and light refreshments which included the tasty local speciality fruit tart, tarte tatin. Optional trips were available on Monday which was unfortunately a wet day. Some chose to tour the local Champagne cellars; the coach tour of the scenic Champagne route on the way back had to be abandoned due to the state of the narrow roads after the rain. Those who visited the castle at Sedan saw better weather. Others spent their free time in Reims visiting the Cathedral and Basilica Saint-Remi. For some a surprise discovery was the building where the World War 2 German Surrender took place. A Museum preserves the actual room as it was on 7 May 1945. 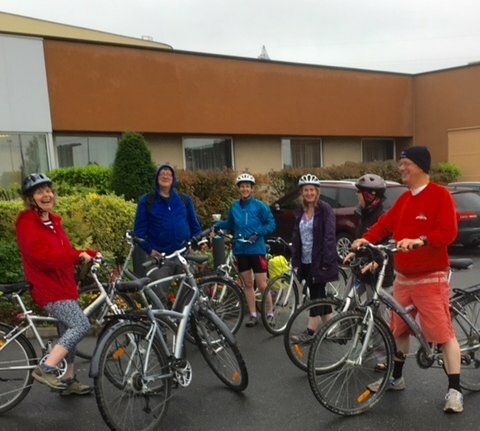 Some enterprising brass players hired bikes with trailers to buy and bring back their bottles of champagne – their arrival back at the Hotel soaked to the skin was quite a sight! In the evening a Group meal was held in Reims – followed by Pat’s traditional speech. The destination on Tuesday morning was the picturesque town of Châlons with its waterways. Sadly, the planned scenic tour in open boats was cancelled due to the wet weather. 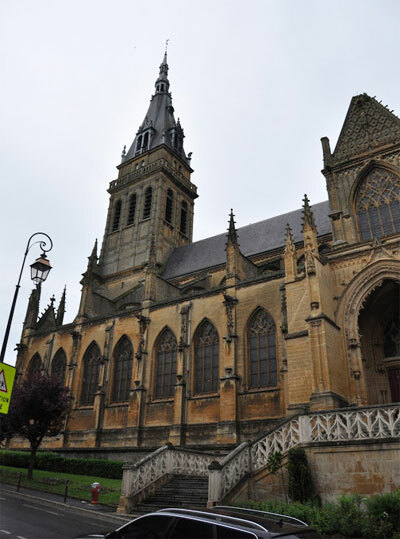 The second concert took place in the evening at Rethel in the Eglise Saint-Nicolas perched at the top of a steep hill where the same programme as Sunday was performed. We were then led down the hill to a Cultural Centre building where refreshments were laid out, including baguettes and again some tarte tatin. An early checkout the next day and we headed for home. There was some trepidation as there were rumours of transport strikes which might affect Calais Port where we were taking the ferry. We made good time and all was well at the Port so a stop was made at St Omer for those who wanted an early lunch. Arriving back in England we encountered heavy traffic which delayed our arrival back in Leicester and threatened the drivers’ allowed hours. A lot was accomplished in the few days – although looking at the photographs some people seem to have spent all their spare time in the bar! So, another enjoyable and successful trip both musically and socially. We showed Leicester boasts more than just a football team! Many thanks to all those who helped organise this tour.